During this breakfast event on Wednesday, March 28th, you will learn how to identify the inconvenient truths that are limiting your organization's ability to thrive, and how to effectively tackle these issues. Everyone agrees innovation matters. Is your organization maximizing the return on efforts? Learn how to identify the “Inconvenient Truths” that may be limiting your organization’s ability to grow and innovate. Develop strategies for taking an impactful approach to innovation using the Organizational Growth Indicator (OGI), a research proven, quantitative tool. • The Book: Grow Through Disruption: Breakthrough Mindsets to Innovate, Change and Win with the O.G.I., by Brett Richards, PhD. 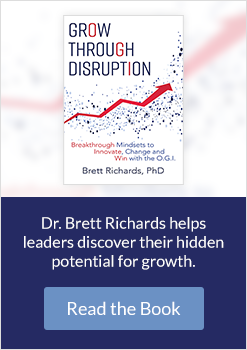 Dr. Brett Richards | Connective Intelligence Inc.